Vegan Baking Tip: To keep caramel from crystallizing, add about 2 Tablespoons agave syrup or corn syrup to your caramel ingredients to keep your caramel from crystallizing after it cools. Melt the coconut oil in a medium heavy-bottomed saucepan. Stir in the sugar, cocoa powder, and salt. Remove from heat and stir in vanilla. 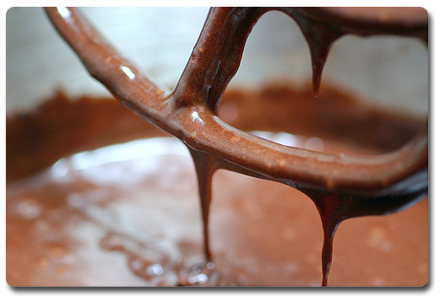 Set the chocolate mixture aside to cool for about 20 minutes. Beat the frosting until it thickens (about 20 strokes with a wooden spoon). Next, spread it over your cake layers. Tip: Make sure you have your cake layers ready to ice before beginning the frosting as it will set up very quickly. If it fully sets up before you finish icing your layers, warm it slightly in a bowl set over simmering water. You could also thin it further with a few drops of coconut milk.